On this page is VALE's correspondence to and from the Australian Government Department of Agriculture and Water Resources. 23 August 2018: VALE's offer to government rejected. 11 April 2018: Letter to Minister David Littleproud re our offer of scientific veterinary assistance. 3 April 2018: Letter to CVO Mark Schipp re Department heat stress thresholds not being supported by scientific and field data. 5 February 2018: Letter to Mark Schipp re incorrect figures in high mortality voyage report. The investigation report was re-written to reflect correct figures but the figures were not changed in the Parliamentary report. Also below is the letter from Narelle Clegg that prompted our response. 7 February 2018: More FOI docs obtained after querying their withholding. 6 December 2017: Letter to the department seeking review of the decision to withhold two crucial reports under FOI. 23 November 2017: Response from the department re FOI request. 23 October2017: Letter to Mark Schipp (DAFF) highlighting concerns about discrepancies in high mortality voyage report. Freedom of Information request regarding the July 2016 voyage of Emanuel Exports Pty Ltd with 4.35% sheep mortality (3027 deaths). 13 December 2013: Letter to DAFF requesting a "show cause notice" after LSS breaches. Still no response. Minster for Agriculture acknowledges that he is aware of the evidence presented in a Federal Court to demonstrate routine overstocking on LE voyages. 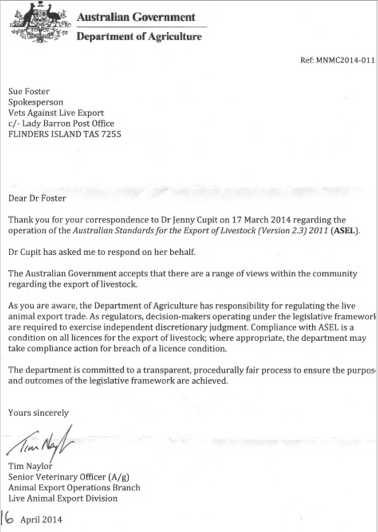 A sequence of letters and correspondence to and from DAFF regarding the substitution of vets for accredited stockpersons on live export voyages and contravention of ASEL requirements for such. It's taken 12 months to get the admission that it happens – now to see why the exporters weren't penalised for breaking the law. Possibly qualifies as a response ... though a blank piece of paper would serve equally well. DAFF explain their penalties are "outcome based" ie no penalty applied for breaking the law if no adverse outcome. Interesting. Would like to try that argument on a random breath test: "Yes officer Im drunk but I never caused a crash so you cant prosecute"!!!! And anyhow, when has a high mortality voyage NOT been an adverse outcome? An admission from DAFF that there had been voyages without stockpersons with reasons as to why no penalties applied: exporter no longer holds a licence (WRONG). Still no answer to our original question though! We provide examples of suspected or known voyages that proceeded without a stockperson as requested by DAFF.